Views and Brews RI - The Hiking and Brew-Pub Page! A Challenge for those who love Hiking and Fine Beer! Google Map for Rhode Island! Finishers - The list of those who have completed the list! 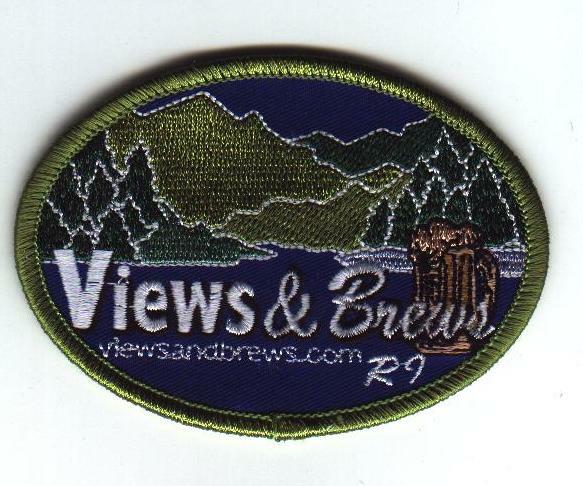 Our Patch is given to people who have visited all of the Brewpubs in this state, tried at least one of their beers, and hiked/walked to the local attraction listed for that Brewpub. To qualify, you must visit the nearby brewpub in the same 48 hour period as you do the associated hike. So, for instance, you can do the hike Saturday and visit the Brewpub Sunday. Or, you can go to the Brewpub Friday night and do the hike the next afternoon. But remember, drink responsibly! (Ok, or something close to that!). The Patch cost is $5.00. You can send us a Money Order, Check, or pay via PayPal. The Paypal address is the same as the email address below. If you use Paypal, make sure you put the information requested on the form in the comments section, and mail us the completed List. The form link is above. If you know of other states that are doing this, or want to start one yourself, let us know! Dawn Hamilton is a Project Manager who works for IBM in Poughkeepsie, NY. She enjoys Travel, Hiking, and sports. Tom Rankin is a Software Engineer who works for IBM in Poughkeepsie, NY. He enjoys Astronomy, Photography, and Hiking.